Massive voter turnout leads to one of the most hotly-contested mid-term elections in decades. 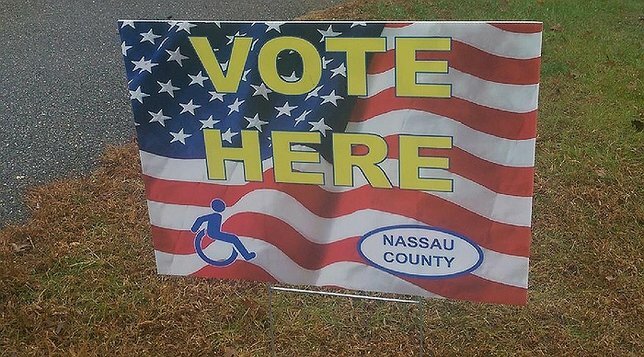 Polling places throughout Nassau and Suffolk Counties saw record turnout for the 2018 mid-term elections. New York, NY - November 7, 2018 - In one of the most hotly-contested 2018 mid-term elections in decades, voters from both sides of the aisle turned out in droves to make their voices heard on a variety of hot-button topics here on Long Island. There were a number of high-profile changes in the political landscape last night that will shape New York’s future – on a local, state, and national level – in a variety of complex ways, and LongIsland.com is here with the biggest results in the race for Governor, Congress, and State Senate, among others. Democratic New York State Governor Andrew Cuomo (59 percent of the vote) defeated Republican challenger Marc Molinaro (38 percent of the vote), Green Party challenger Howie Hawkins (1 percent of the vote), Libertarian challenger Larry Sharpe (1 percent of the vote), and Serve America Movement challenger Stephanie Miner (0 percent of the vote). Incumbent Thomas DiNapoli (66 percent of the vote) defeated challenger Jonathan Trichter (31 percent of the vote). Democratic candidate Letitia James (62 percent of the vote) defeated Republican candidate Keith Wofford (36 percent of the vote). Current NYS Attorney General Barbara Underwood did not take part in the election. Democratic U.S. Senator Kirsten Gillibrand (66 percent of the vote) defeated Republican challenger Chele Farley (34 percent of the vote). Republican U.S. Representative Lee Zeldin (59 percent of the vote) defeated Democratic challenger Perry Gershon (46 percent of the vote). District 1 includes most of Central and Eastern Suffolk County. Republican U.S. Representative Peter King (53 percent of the vote) defeated Democratic challenger Liuba Grechen Shirley (47 percent of the vote). District 2 includes southwestern Suffolk County and a small portion of southeastern Nassau County. Democratic U.S. Representative Tom Suozzi (58 percent of the vote) defeated Republican challenger Dan DeBono (42 percent of the vote). District 3 includes most of the North Shore of Long Island. It expands from northwestern Suffolk County, across northern Nassau County, and into far northeastern Queens. Democratic U.S. Representative Kathleen Rice (61 percent of the vote) defeated Republican challenger Ameer Benno (39 percent of the vote). District 4 includes communities in central and southern Nassau County. Democratic U.S. Representative Gregory Meeks ran unopposed for re-election. District 5 is mostly located in Queens, but a small portion is located in Nassau County. Republican State Senator Kenneth LaValle (58 percent of the vote) defeated Democratic challenger Greg Fischer (42 percent of the vote). District 1 covers five East End towns of Long Island, New York and the eastern half of the Town of Brookhaven, New York. Republican State Senator John Flanagan (55 percent of the vote) defeated Democratic challenger Kathleen Cleary (45 percent of the vote). District 2 covers center Long Island's 29 census-designated places, including Stony Brook. Democratic challenger Monica Martinez (51 percent of the vote) defeated Republican incumbent Dean Murray (49 percent of the vote). District 3 covers a portion of Suffolk County's central southern region, including townships of Brookhaven and Islip. Republican State Senator Phil Boyle (52 percent of the vote) defeated Democratic challenger Louis D’Amaro (48 percent of the vote). District 4 covers a portion of Suffolk County's central southwestern region, including a portion of Brentwood and Islip. Democratic challenger James Gaughran (54 percent of the vote) defeated Republican incumbent Carl Marcellino (46 percent of the vote). District 5 covers a portion of Nassau County and Suffolk County, including a portion of the city of Glen Cove and towns of Huntington and Oyster Bay. Democratic challenger Kevin Thomas (51 percent of the vote) defeated Republican incumbent Kemp Hannon (49 percent of the vote). District 6 covers a portion of Nassau County, including the towns of Levittown, Hempstead, and Garden City. Democratic State Senator John Brooks (55 percent of the vote) defeated Republican challenger Jeffrey Pravato (45 percent of the vote). District 8 covers a portion of eastern Nassau County and western Suffolk County. Democratic State Senator Todd Kaminsky (62 percent of the vote) defeated Republican challenger Francis Becker (38 percent of the vote). District 9 covers a portion of western Nassau County, including a portion of the Town of Hempstead and the city of Long Beach. Subject: LongIsland.com - Your Name sent you Article details of "New York 2018 Election Initial Results – Cuomo Re-Elected Governor, Congressional and State Senate Seats Decided"